Beyonce Impostor So NOT Beyonce. Museum Fooled. Check out these pictures of the Beyonce impostor chick in Vienna. Is it just me, or does she look nothing like the real Beyonce? 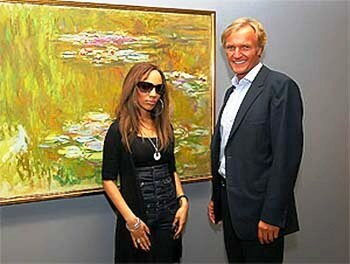 A radio station in Austria called the Albertina Museum on Tuesday saying Beyonce would be visiting them. But it was all a hoax, with an impostor arriving at the museum instead. Man, she looks nothing like Beyonce. Austrians are gullible. On a totally unrelated note, did you know that David and Victoria Beckham have been married for 10 years? Even more surprising is that Victoria is planning a small celebration. Victoria had reportedly been planning the extravagant event with the help of A-list pals Jennifer Lopez, Eva Longoria, Katie Holmes, and Heidi Klum, but with hubby David spending the summer playing soccer in Italy for his tenure with the AC Milan, the fashionista has decided to keep the festivities low-key. “They have some private 10th anniversary celebrations planned,” says a spokeswoman for the couple. next post: When Is Mother’s Day 2009? It’ll Be Here Before You Know It!